Half term and feeling SAD. I haven't updated this blog in over a week because, to be honest, I just haven't felt like it. When I feel depressed, I find it hard to get motivated to do much. But today I've given myself a goal of doing the blog before I have to collect Missy. Last week was half term and Daddy was home from Saturday to Wednesday. 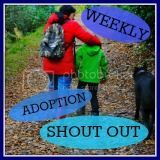 We kept to routine as much as we could but we did have a couple of days out, including to the zoo and to a soft play event on Wednesday, organised by Adoption Support at our LA. Monday and Tuesday were gorgeous sunny days and meant we could sit outside enjoying some sun. Years ago one GP suggested I may be suffering from mild Seasonal Affective Disorder (SAD) often known as winter blues, where sufferers feel very depressed, lethargic, often anxious. Lack of sunlight is thought to affect production of a hormone called serotonin, the 'feel good' hormone, and is also thought to affect the body's natural rhythms. So sitting on the backdoor step in the beautiful sunshine was like getting a massive dose of good medicine. The soft play event was excellent. There were about 80 or so children, all adopted or to-be adopted, plus parents. It was not only fun for the kids, but a great opportunity to speak with other adopters about their experiences. At an event like this, parents can relax a little and not feel the need to apologise or feel embarrassed by their child's behaviour, because chances are that most of the parents have experienced the same from their child. I made a couple new friends and Missy appeared to have a fairly good time too, although anxiety was evident as she didn't really want to talk with us and had her 'thunder' face on each time she came back to us. But on the whole it was a good experience for all of us. Thursday wasn't so fun though as Daddy went abroad with work, due back this evening. I think this was one of the triggers for my panic attack recently. Thankfully my Mum came over to stay for two nights then on Saturday night we went to Mum's and came back yesterday. Thank God for my Mum otherwise I would have imploded. Missy had a few tantrums and strops when she got anxious and, unsurprisingly, didn't settle straight away in her bedroom at my Mum's. She's not a naughty girl as such, but does like her own way and needs to be in control so setting boundaries can cause issues. The main thing is her constant attention seeking and non-stop chatter. If she isn't talking, she's singing. It's exhausting. Mummy this, mummy that. I felt anxious when I woke up this morning and had thoughts about being child-less but when Missy got up she gave me a hug and a kiss which made me feel happier but also guilty for thinking like that. The food obsession, fibbing and being ill obsession was in full swing this week from Missy, plus out of the blue at my Mum's she said she didn't want to live with me and Daddy forever and missed her old mummy. But the next minute she completely changed the subject and was showing my Mum how she draws something. I didn't feel too upset as I've heard from many adopters that adoptees can say this and it's just part of grieving for their old life. It did throw me a bit though. But the last few days must have been unsettling for Missy, what with Daddy away (she asked me if he was coming back) and staying in a strange new bed. I've got to drag myself out to the shops later as the cupboards are almost bare and I've got to make myself reply to two emails from friends. In return I can treat myself to something nice. I've had depression before and it feels like I'm in a dark forest and I can't see which way to turn. My head is so foggy. So I have to give myself little goals and gradully pull myself through until the fog clears. Roll on tonight when we pick Daddy up from the station (I hope he's brought me a present). I had a panic attack last night. At midnight I woke up with a start, with an impending sense of doom. A panic attack is so much more than feeling anxious or worried. To help self-diagnose, The Anxiety UK website asks: "Have you experienced sudden attacks of intense anxiety or fear during which you felt as if you were going to die, or lose control, or go crazy?" Yes, that's how I felt. It was scary. I couldn't lie down, I couldn't just sit there. I got up, walked around, went downstairs, felt very agitated. Nothing Daddy did could help. For the first time in my life I was afraid of the dark. I had some very threatening and dark thoughts. Ten minutes later, thankfully probably because I was so tired, I managed to fall back asleep. On waking, I felt ok although this last week I haven't felt brilliant in general. I still have the remnants of flu and a lack of energy and I'm not looking forward to Daddy going away with work later in the week. I'm still feeling inadequate as a mummy (see Bad Mummy). If I could spend the day sitting on the sofa flicking through the tv channels, I probably would. What I am probably suffering from is post-adoption depression. I've had depression before, back in 1999 and then again in 2002. The fact I've suffered is not a negative point for the social workers. The fact I've coped with it and got through it is actually a positive. One of the ways I got through it before was using homeopathy and I'll be turning to this therapy again. I'm against anti-depressants as they just cover up the symptoms, not get to the root cause. I'll be talking about it with the social workers too. My Mum is a massive support and a few of my adopter mum friends will be there for me. I mentioned it to one of my best friends on Friday when we met for coffee (I am getting myself off the sofa) and she had some wonderful words for me, so supportive. I've also made a friend of one of the mums at the school date - hurrah. She is lovely and we hit it off straight away and I told her about the adoption when Missy was invited for a play date last week. Plus, it really goes without saying, that Daddy will be there for me. Yet with all the support, depression of any kind is lonely. No-one apart from the sufferer truly knows what is going on in the sufferer's head and only the sufferer will know what is their personal formula for improvement. Every one is different. For me, kind words, positive words, hugs and drugs all go a long way to help but ultimately it's down to me to help me. All of this does not mean I'm not striving to give Missy the best care though. I will always do that (although I'm still on a massive learning curve). We've had an up and down week. One moment she's an angel, funny, delightful and the next she is a little devil. She was a devil at her friend's house - wouldn't talk to me, was rude and stubborn. She's been answering back a lot lately and has been very moody. On a positive note, she has been playing by herself more (it was lovely to hear her in the garden today playing with a football and even lovelier seeing her have so much fun when Daddy joined in), her artwork is awesome, there have been small improvements in her number work and she definitely seems to be building some attachment to us. 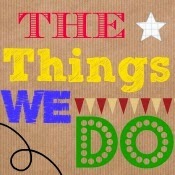 Missy's school held a disco last week, the first sitting being for nursery, Reception and KS1. I wasn't going to not let Missy go but I knew she would find it a little difficult. Whilst Missy is very age appropriate in many ways, she does have a little catching up to do in the social and emotional areas. If you ask her to dance at home to music, she is like a whirling dervish, showing off her rmoves, laughing and giggling. At the disco she was the opposite. On the dance floor she looked a little lost, not really knowing what to do, not until a classmate came along grabbed her by the hand and started dancing. At this point she would break out into an enormous smile. She'd dance with them but then, like many 5-7 year olds, they were off again at 100mph round the dance floor leaving Missy alone again. When she caught my eye and I displayed a few moves (of sorts! ), she'd stare and frown at me (and no, it wasn't because my moves were embarrassing) and look the other way. I wanted to scoop her up and dance with her but this would have led to a tantrum. The hour-long disco was clearly stressful at times for her. When she asked me to take her to the loo, she was angry, when we walked back to the car she was grumpy, when we got back in she wouldn't tell Daddy about the disco. When in the company of several children, Missy usually spends much of the time staring at them, trying to make sense of what they are doing. At the disco, much of what she did was copying the other children. And that's good, that's how children learn, by copying. It was a shame though that she didn't enjoy the disco as much as many of her classmates who are confident, have high self-esteem and just know what to do. At least though I now know what the kids of these ages are listening to. I stopped listening to the charts in the late 80s! And I distinctly remember Heart of Glass by Blondie and Up Town Rankin by Althia & Donna being played at my school disco. When Missy came out of school on Monday, Daddy, who wasn't working that day, instantly saw that something was up when she got in the car. Usually she is asking for her snack, doing her drawings, chatting non-stop but on Monday she snuggled on the sofa with Daddy and I didn't hear a peep out of her for an hour. That's when I knew something was wrong but Daddy had spotted it earlier. Why didn't I spot it? I felt like a bad mummy. By 5pm Missy was burning up. We took her down to her vest and jeans and took her temperature - 39.9c. What to do? I hadn't a clue and had to look on the internet. Daddy took charge and once again I felt like a bad mummy for not really knowing. Daddy checked on her later in bed and she was sweating. I still can't check on her after she's gone to bed. I don't know why, perhaps I don't want to wake her up and disturb her, perhaps I've closed the (bedroom) door on being a mummy at 7pm in need of slumping on the sofa for a rest. Bad mummy again? I've got to do it soon though as Daddy is going away on business. So, Missy was off school Tuesday and Wednesday as her temperature was still high, though she was pretty much back to her usual self on Wednesday. I was exhausted though, having never looked after an ill child before. Thankfully back to school yesterday via the eye clinic, although Daddy was off work yesterday with very bad sciatica so I'm feeling a bit like a nurse this week. In other news, it's the school disco tonight. I wonder what they'll be dancing too? In my day it was Blondie and The Buggles. "Waves of doubt keep drowning me"
There's a song by Level 42 called Lessons in Love that contains the words "waves of doubt keep drowning me". I think us adopters could re-write the song and call it Lessons in Adoption but keep those same words. OK, I'm not being drowned any more like we were back in November/December but waves are still lightly lapping up around my feet. Only occasionally though. Every now and then a little wave of doubt, of mild panic, washes over and I worry but then we have a day like today when Missy has been pretty much perfect (ok, there are 90 mins left before she goes to bed as I write so this could all change*). But yesterday morning after Daddy had done an excellent job getting her dressed and washed, playing their usual games, I tried to do her hair and ended up walking out of her room after she had a tantrum, hit me and then hid in a corner. I walked out rather than let her see me cry. Daddy sorted the situation and we had all had a hug. The Adoption UK monthly magazine then arrived. It's a very useful magazine but the first article I read sent one of those waves washing up. It's a bit like one step backwards and two steps forward (which sounds far more positive than two steps forward and one back). We're making progress albeit slowly. We're heading in the right direction and stop a while when one of those waves comes in, then we move forward again. Last night I went out with the local adopter mums' support group for a meal. It's so great to speak to other mums and share our situations, our issues, our life with mums who get what is happening. I have lots of lovely friends who are very supportive in regard to how hard parenting is, but, apart from two, they don't get that parenting an adoptee makes things that bit more difficult. Why is my daughter so anxious about going to a particular shopping centre - has she remembered something from her past? Why doesn't she like feathers? What makes her hyper-vigilant? Does she understand why it wasn't safe with her birth mum, what does she remember? Is a song I'm playing triggering a memory? What are these 'sad feelings' she has which she cannot explain to us? I guess only adoptive parents will really understand what I mean here. In other news, my tax rebate is due and I'm treating myself to a massage. Yeah! * Missy had a little grumble but I'll put it down to tiredness.